In order for an Environmental Management program to be sustainable, the sharing of knowledge, experience, new ideas as well as the alignment of diverse activities are crucial – Environmental Management in my view is a project of continuous improvement and development. 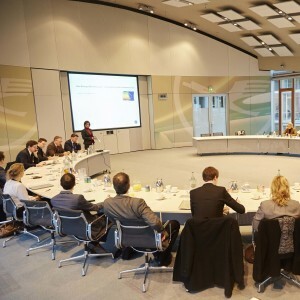 An opportunity for inspiration that comes up twice a year is the Lufthansa Group Environmental Forum. It is an excellent chance for me to discuss with colleagues, exchange opinions and return to the office with fresh ideas and new tasks. During this one-day meeting, the environmental managers from all Lufthansa Group subsidiaries typically present updates from their respective business areas, while discussing current and upcoming projects. In addition, dedicated experts join us each time providing useful insight coming from different industries or government institutions, such as updates regarding current legislation or well-received innovations. For instance, a prevailing topic that was discussed in our meeting in January was that of the new energy efficiency law in Germany. In order for a continuous improvement cycle to bear fruit, it is essential to foster a culture of innovation within the company. The larger the pool of new ideas that are fed into this cycle, the higher the chances to boost innovation! In order to nourish this type of thinking within our organization, we have established a community which consists of the Environmental Managers from all our regions, where best practice cases are shared on a regular basis. Projects that are usually in the forefront of our talks concern energy and water saving techniques, waste reduction practices but also processes and trial results regarding new recycling methods. With a broad array of views and diverse projects, these discussions have always proven to be very productive, and have led to innovations and projects that are already implemented somewhere near you right now. Did you know that LSG Sky Chefs is working with an external consulting firm to ensure that we always adhere to local legislation and regulation, no matter which corner of the globe we operate in?